The first time I made a variation on this was 3-4 years ago and I was blown away. It might sound weird but the combination of sweet fig jam with salty prosciutto and tangy blue cheese is magical. In the past I have used chopped fresh figs as well and it was delightful! Ideally, flatbreads should be made on a pizza stone in your oven or on a charcoal grill. However, I live in a tiny NYC apartment without a pizza stone or a grill so I just make the oven super hot and go for it. This is an awesome appetizer, cut into squares or slices, for a dinner party. The best part is reheating leftovers for lunch the next day! I suggest serving it with arugula tossed with a light mustard vinaigrette. Caramelize the onion slices in a small saucepan and set aside. Lightly grease a 1/2-sized baking sheet with olive oil. Stretch the pizza dough to shape into the baking sheet. It should be an even thickness and no thicker than 1/4″. Spread the fig jam, or chopped figs, on the crust leaving 1/2-1″ of crust. 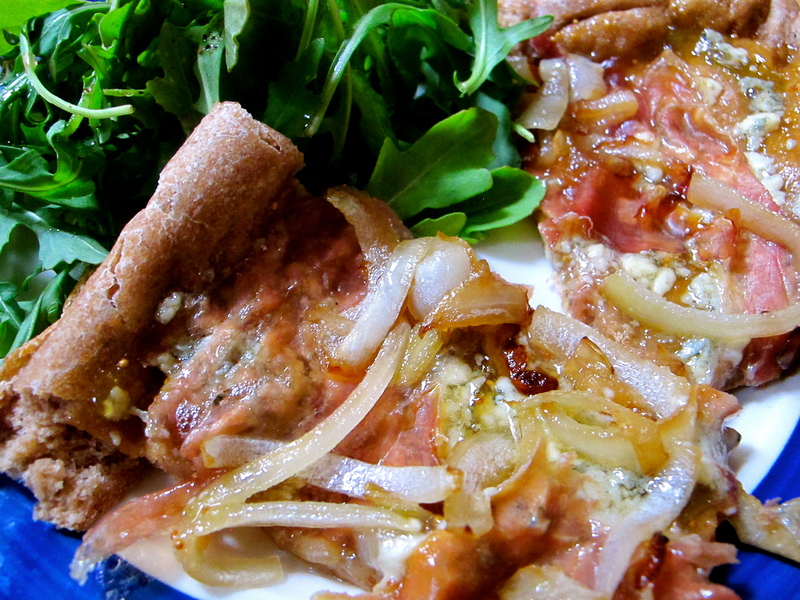 Evenly sprinkle blue cheese on crust and top with onion and prosciutto. Bake in oven for 10-15 minutes until brown and bubbly. Slice and serve hot or at room temperature!